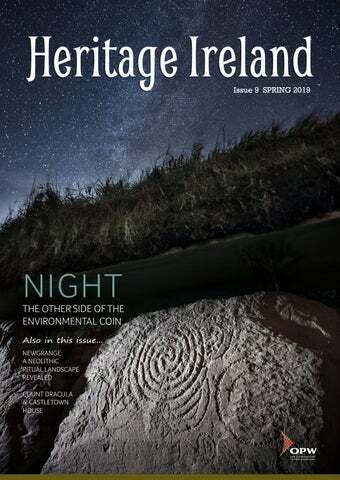 Welcome Hello to all our Heritage Ireland ezine readers and welcome to our Spring 2019 edition. It’s a busy time in the OPW’s Heritage Services as we lift the dust covers and prepare our sites to start welcoming visitors. We will have many new delights and surprises for visitors in the coming season. Our Minister of State, Mr. Kevin Boxer Moran TD, recently announced an investment with our strategic partners, Fáilte Ireland and the Department of Culture, Heritage and the Gaeltacht, of €5million at Brú na Bóinne. This includes a wonderful new facility which will open at Knowth in April, celebrating the megalithic art at the site. This stunning state of the art exhibition will explore how the art was produced as well as its significance and you can catch a sneak preview just a few pages further on. Newgrange itself will benefit from improved interpretation and Brú na Bóinne Visitor Centre will also get a facelift and will be ready to show off its new splendour later in the summer. There will be some little disruption for visitors while the works are ongoing but we ask for your patience and promise you that it will be worth it. We are sure you will agree that the fabulous monuments that comprise this UNESCO World Heritage site deserve the very best in terms of interpretation and visitor facilities. As well as all of the new developments to look forward to there are some recent ones you might have missed so why not savour tea at Portumna Castle in the stunning tearoom in the recently restored 17th Century Courtyard buildings or imagine you’re a Tudor at Ormond Castle, the best example of an Elizabethan Manor House in Ireland which looks absolutely magnificent following extensive works. We continue to strive to make it easier for people with particular challenges to come and visit. Last year Minister Moran introduced an initiative to admit people with disabilities and their carers for free to all paid admission sites. We were delighted to be able to offer this concession and hope that many people will avail of it in the coming season. In tandem with this we offer a series of Irish Sign Language interpreted tours across a number of our sites. In the past these have been mostly confined to the Greater Dublin area but this year we are delighted to include the Rock of Cashel and Charles Fort in Kinsale. We must mention and give thanks to the very talented guide staff who welcome visitors to our heritage sites and the highly skilled works staff who ensure our sites are maintained to the very highest standards. We are very proud of the dedication and skills of our workforce. In conclusion, we hope that all our readers enjoy this small taste of what we have to offer right around the country. We’d love to see you at some of our wonderful properties and we encourage you to come and visit us; wherever you are, you can be sure that there’s a Heritage site not too far away. Check out our website at www.heritageireland.ie and we’ll see you there! Contributors AOIFE TORPEY holds a degree in History and English Literature from Trinity College Dublin, and has recently completed an MA in Museum Studies with the University of Leicester. She has worked in Kilmainham Gaol Museum since 2015, where she looks after the Museum’s wonderful collection of historical objects. PAUL O’ BRIEN MA, a military historian and author, works for the Office of Public Works and is currently based at the Royal Hospital, Kilmainham. PAULINE KENNEDY, Supervisor, manages the guiding service, visitor experience, education and outreach at both Castletown House in Celbridge as well as at Casino Marino in Dublin. CATHERINE BERGIN is a guide at Castletown House (pictured here in costume). Catherine is an historian and archaeologist, qualifying with her PhD in history from Maynooth University. This card gives the holder unlimited admission all Heritage Sites listed to in the brochure Heritag e Sites of Ireland for one year (with the excepti on of Muckross Traditio nal Farms). This card is non-transfer able and may only used by the signato be ry. No liability shall attach itself to the Office of Public Works or the State for any damage, injury or loss to the person or proper ty of visitors to these sites howsoever caused. Leis an gcárta seo, beidh cead isteach gan teorain sealbhóir chuig gach n ag an Láithreán Oidhreachta atá sa bhróisiúr Láithreáin Oidhreachta na hÉireann ar feadh aon bhliana amháin (seachas Feirme acha Traidisiúnta Mhucro is). Tá an cárta seo neamh -inaistrithe agus ní fhéadfaidh ach an sínitheoir leas a bhaint as. Ní bheidh aon dlitean as ar Oifig na nOibre acha Poiblí ná ar an Stát as díobháil, gortú nó caillteanas ar bith don duine nó do shealúc a tharlaíonn has daoine a thugan n cuairt ar na láithreáin seo, beag beann ar an gcaoi ar tharla sé. RÓNAN MAC GIOLLAPHÁRAIC is a native of Inis Mór. Rónan holds a BA in Archaeology and Geography from NUIG and has worked at Dún Aonghasa for a number of years and as head guide since 2018. JIM MULLIGAN is a seasonal guide at the Rock of Cashel, Co. Tipperary. Brian has had a long interest in astronomy that eventually led to his current position as Associate Professor in Astrophysics in the School of Physics, Trinity College Dublin. After receiving a degree in Experimental Physics from TCD, he went on to undertake a PhD at Cambridge studying active galactic nuclei (quasars). He went to the United States in 1990 to work on a Hubble Space Telescope project, and also worked on the highly successful Astro-2 Space Shuttle Astronomy mission in 1995. His next job was as Assistant Astronomer working with the Hubble Space Telescope for the European Space Agency at the Space Telescope Science Institute in Baltimore, MD. Subsequent to this, Brian returned to Trinity as the first member of the astrophysics group and developed the popular astrophysics course. BRIAN ESPEY is Associate Professor of Astrophysics, School of Physics, Trinity College Dublin. Michael Loughran, Brian O'Brien. Layout & Design: Sinead Mallee. s part of my job I have had the good fortune to observe near-pristine night skies around the world and I never cease to be impressed by how well adapted our eyes are to function at levels most people would regard as inky black. When properly dark adapted we can see hints of colour in the sky from recombining atoms at the edge of space, or the faint glow from dust left over from collisions in the early solar system. It is also surprising each time I notice the shadows cast by starlight or the glory of the Milky Way or a bright meteor streaking across the sky. The experience of true night focuses one simultaneously on our smallness in terms of the wider universe, but also increases the sense of self and our embedding in the myriads of stars overhead. benefits for modern life, but it should be used responsibly and limited to intensities, locations, and times where really necessary. While the introduction of better shielded LED technology can lead to improvements in respect of both energy use and light spill, the main energy savings will accrue from reduced light levels or times. Consider that the prevalent blue-rich light is installed to the same visible light level (lumens) as older lights, but produces more light in the blue part of spectrum to which our night vision is sensitive: we can therefore achieve similar levels of visibility with reduced light and energy use. We should look anew at how we are using light as it becomes increasingly apparent that higher levels of light- particularly blue-rich light - can have deleterious effects on sleep and health. To put it in another topical context: if we could produce more plastic more cheaply, should we do it? To close I can only quote David Attenborough: “No one will protect what they don't care about; and no one will care about what they have never experienced.” We should consider protection of the night-time sky as a natural part of our culture and heritage and as part of the educational experience for the general public. If we are more sensitive to night-time light we will not only save energy and help achieve our climate change targets, but we could open up a new approach to tourism. View of the floodplain from the Great Passage Tomb at Newgrange, looking south. The Newgrange floodplain, showing the moisture-starved fields, viewed from the south-west. principal sites that we have identified, interpreted and mapped. These include features that were previously unknown in the Irish archaeological record and display a sophisticated layout and design. The western henge complex On the west of the floodplain a distinct group is formed by Site P, the Geometric Henge, the Univallate Henge and a potential fourth site that we have named the Hidden Henge. The alignment of three of these henges in a south-easterly direction appears to be related to the southern edge of a large palaeochannel that traverses the Newgrange floodplain. Site P with principal features annotated, viewed from south-west. High-contrast image of the Geometric Henge, looking south-east. of the layout of its enclosing elements. This henge, nicknamed ‘Dronehenge’ by Murphy and Williams, comprised three elements: an outer ring of postholes, a middle ring of post-holes and an inner enclosure defined by double segmented ditches. All three elements appear to be concentric, suggesting contemporaneity, and are most likely the product of a single architectural concept. Site P Site P, first identified in the early 1950s, is of the earthen embanked enclosure variety. The bank of such sites appears to have been constructed from material excavated from the interior of the site, leaving a broad, dished interior. The drought conditions highlighted the ‘bare bones’ of this site, exposing clearly an inner ditch, a smaller outer bank and a projection or annexe on the south-east. Along the eastern perimeter there is an outer extension to the enclosing elements—an annexe—evidenced by a series of ditch segments arcing outwards from the perimeter of the inner circle. This annexe appears to incorporate features that are likely to form an entrance leading to the interior of the henge. A rectangular structure can be clearly seen on the west-north-western perimeter of the double-segmentedditched enclosure, occupying most of the space between the enclosure and the two rings of timber posts. The rectangular structure measures 22m x 16m externally (18m x 11m internally). On close inspection the cropmarks appear to reflect subsurface ditches with irregular edges, suggesting a series of large timber posts set into oblong trenches. The Univallate Henge Another henge defined by a broad bank with an internal segmented ditch became apparent. This site had been located previously by Steve Davis and Kevin Barton as a result of LiDAR imagery and geophysical survey. The aerial photographs showed the complete enclosure, c. 128m in diameter, with a central mound and an unusual configuration of timber posts at its centre. Furthermore, at the northwest perimeter an oblong enclosure can be clearly seen. View across the Newgrange floodplain from the west, showing the alignment of the henges (right). The dark linear band indicates differential crop growth over a major palaeochannel, within which there is an extant pond likely to have been of ritual significance in the Neolithic. NEWGRANGE: A Neolithic ritual landscape revealed... The Hidden Henge There is also evidence of a more subtle nature for the existence of another henge between the Geometric Henge and the Univallate Henge. The enclosure of this ‘Hidden Henge’, c. 98m across, appears to be contiguous with the outer edge of the bank that forms the Univallate Henge to the north-west and would be contiguous with the outer timber circle of the Geometric Henge to the east. This enclosure has some of the features of the Geometric Henge. At the west-north-west the circular enclosing element appears to be aligned on a rectangular feature that may be the fragmentary remains of a structure similar to that on the western perimeter of the Geometric Henge. Site B henge complex Site B is a large mound close to the Boyne on the east of the floodplain, on the lowest alluvial terrace. Close to the mound in grassland, three enclosures showed up clearly on the aerial photographs. These henges form a distinctive group and their design seems to contrast with the henge group on the west. Two large henge monuments, subcircular in plan and similar in appearance on the aerial photographs, can be seen. GS plan showing the Univallate Henge (left), the Hidden Henge (centre) and the Geometric Henge (right). The henge enclosures are defined by broad banks, each with an external ditch. The southern perimeter of the larger of the two henges (c. 160m in diameter) appears to run along the upper edge of the riverbank. The second henge (c. 120m in diameter) is only 12m from the perimeter of the Riverside Henge and appears to enclose a low mound at its centre. (Below) High-contrast image of the henge complex near the mound known as Site B (top left), showing as differential growth in grassland. The smallest henge in this group, c. 40m in diameter, is located close to the step of the next alluvial terrace. While it is significantly smaller than the henges on the floodplain, there is evidence that it comprises an outer bank with an internal ditch in which there are large post-holes. The Four Poster Enclosure The Four-Poster Enclosure is located close to the north-east corner of the field, immediately to the south of Newgrange Farm and c. 460m southwest of Newgrange Passage Tomb. It is sited on level ground on one of the upper alluvial terraces overlooking sloping ground, the palaeochannel and the pond to the south. The Four-Poster Enclosure, so called after the four large post-holes located within it, manifested itself in great detail on the aerial photographs. The enclosure is defined by two rings of palisades, 5.1–5.8m apart. The inner ring defines a circular area c. 22m in diameter. The outer palisade is elliptical in plan, measuring 32m north–south and 28m east–west.
. The lighter-toned cropmarks (negative cropmarks) between the two palisaded enclosures most likely indicate the presence of a bank. An entrance, c. 3.2m wide, can clearly be seen on the eastsouth-eastern perimeter of the enclosure, providing access through both palisades. The cropmarks indicate a structural emphasis of the entrance, with a thickening of both palisades on either side of the gap. Outside the enclosure and on the same axis as the entrance there are traces of two parallel lines of post-holes, most likely forming an ‘avenue’ leading to the enclosure. (Above) Tableau showing comparative sizes and designs of the Newgrange henges. Top row, L-R: The Univallate Henge, the Hidden Henge, the Geometric Henge, Site P. Bottom row, L-R: Site A, the Riverside Henge, the Small Henge, the Small ‘Enclosure’. showing double ring of post-holes, viewed from north-west. Curving line of outer enclosure comprising double palisade and bank is visible on left of image. The architectural layout of the site bears strong similarities to other such known sites that have been interpreted as Late Neolithic mortuary enclosures where excarnation rituals took place. A similar site was excavated close to the entrance of the Eastern Passage Tomb at Knowth, while another example was excavated near the Giant’s Ring at Ballynahatty, Co. Down. The Four-Poster mortuary enclosure is located within a larger subcircular enclosure measuring 92m north–south and 95m east–west. This outer enclosure comprises a closely set double palisade most likely constructed on a bank, which shows up clearly on the aerial photographs. field boundaries and how the Great Palisade curves around the south-east corner of the enclosure. NEWGRANGE: A Neolithic ritual landscape revealed... This cropmark enclosure, c. 440m south-east of the Newgrange Passage Tomb and c. 36m north of the perimeter of the Site A henge, is one of the exciting new additions to the Brú na Bóinne archaeological landscape. Its morphology is similar to sites that have been recorded from the air in analogous Neolithic landscapes in Britain. Such sites are interpreted as long mortuary enclosures, used for the ceremonial exposure of the dead on platforms erected in the interior. Great Rectangular Palisade Enclosure In 2015 geophysicist Joanna Leigh carried out a survey of the field to the south-west of the old Tourist Board Office at Newgrange on behalf of the OPW. The survey results identified a rectangular structure, just over 70m long, aligned east–west. Geraldine Stout carried out exploratory test excavations, uncovering some of the pits in the interior of the site. A sample of carbonised material from a charcoal-rich deposit in the basal layers of the inner ditch was submitted for radiocarbon analysis and yielded a Late Neolithic date of 2632–2472 cal. BC (95.4% probability). The drought conditions have helped to elucidate more features of the site, revealing that it is even more impressive than was first thought. In spite of the site’s location in a field used for pasture, the NMS aerial survey has added significant additional details. The outline of the structure, located c. 150m south-west of the Newgrange Passage Tomb, is defined by a parallel arrangement of large slottrenches forming a continuous boundary. The footprint of the site can be shown to be at least 190m long. The evidence for its western terminal is obscured by modern farm buildings. Annotated image of the Great Rectangular Palisade Enclosure, indicating principal features. the ground. The entire enclosure is located on an oblong levelled area. This site stands out as one of the most remarkable features of the Newgrange ritual landscape. Its design and scale are unparalleled in the Irish archaeological record. The components of the site as it appears on the aerial photographs would suggest upright timbers, laid out along the long axis of the structure in a symmetrical pattern. As with the other newly identified sites (the palisades, mortuary enclosures and timber settings), the scale of this structure is indicative of the massive resources required to construct it and suggests that, whatever its exact function, it could have accommodated a large gathering. High-contrast image of the Great Rectangular Palisade Enclosure, showing the traceable extent. Annotated image showing view of triple palisade, looking south-east. continuous, as it arcs inwards on encountering the upper edges of the palaeochannel. planning and construction of such a large, complex palisade feature must have required massive resources. The course of the triple palisade can be traced for a distance of c. 900m. It is likely that it may have an irregular curvilinear shape. It is tempting to think that it may enclose the Newgrange Passage Tomb and the entire ridge. Even with our currently limited knowledge of the northern portion of the triple palisade it is clear that it would have functioned as a significant division of the ritual landscape of the Newgrange floodplain. We can already see that the large, discrete henge monuments lie outside the triple palisade feature, while other monuments would have been contained within it. View of the Great Palisade curving around the outer palisade enclosure of the Four-Poster Enclosure, viewed from the south. ‘These remarkable archaeological discoveries are a significant reinforcement of the UNESCO World Heritage inscription and will transform our understanding of Brú na Bóinne. It is wonderful new knowledge for the OPW’s Brú na Bóinne Visitor Centre, which is being redeveloped with the support of my Department and Fáilte Ireland, which will let us tell the ancient story of this wonderful landscape to an international audience and help attract an increased number of tourists to the area, contributing to the local economy. These discoveries will inspire much interest and will attract further research and interpretation. My Department looks forward to working with the landowners and academic institutes and researchers in the years ahead on ensuring the secrets these sites still hold are revealed.’ Further details of the sites described above can be found on the Department of Culture, Heritage and the Gaeltacht website: https://www.archaeology.ie/sites/default/files/files/bru-na-boinne-interimreport.pdf. ithin the grounds of the Royal Hospital Kilmainham there are three graveyards. Adjacent to Bully’s Acre the oldest cemetery in Dublin city are two military graveyards for the pensioners and staff that once resided within the majestic confines of the RHK. It is said that every headstone tells a story and those that are left here are no exception. Often broken and in disrepair these weatherworn reminders represent an individual’s life, often lost but hopefully not forgotten. This is the story of one such man, a headstone in a forgotten graveyard, a casualty of the Great War. Charles Harold Blackburne was born on the 20th May 1876. He was educated at Tonbridge School and it was here that his interest in military life commenced. He was described as very much the dashing and handsome young officer. He was five foot and ten inches and a half in height. His weight was twelve stone. His hair was brown and he had blue eyes. South Africa provided Charles Blackburne with opportunity and fortune. This was far removed from his home in England. Fuelled by the stories of military adventures in India and Africa he enlisted in the Imperial Yeomanry. He joined the regiment on the 9th January 1900 at Maidstone in Kent. He was 24 years old. He enlisted as a private and rapidly rose through the ranks to receive a commission of captain by late 1900. GONE BUT NOT FORGOTTEN FEATURE On August 30th Captain Blackburne and his troop were patrolling the Elands river bridge crossing, an area that was a constant hive of enemy activity. As his men entered the water, a concealed group of Boer commandos opened fire on the patrol. The troops found themselves prevented from crossing the river by coils of barbed wire that had been anchored to the bed of the river. Withdrawing to the bank, Captain Blackburne shouted the order to dismount and take cover. The patrol returned fire while bullets and shrapnel sprayed around them. The first volley of Mauser bullets had claimed two casualties who now lay wounded in the open under heavy fire. Captain Blackburne assessed the situation, holstered his revolver and ordered his men to lay down a covering fire. He then crawled out to the wounded soldiers and with three of his men carried them to safety behind some rocks.2 The Boer commandos retreated from their concealed position, and this enabled Captain Blackburne to return to camp. staff officer 2nd grade. Two years later while still resident in Ireland he was promoted to a grade 1 staff officer on April 19th 1918. On October 10th 1918 Charles Blackburne booked passage from Kingstown (now Dun Laoghaire) to Holyhead on the Royal Mail Steamer ‘The SS Leinster’. Accompanying him on the journey were his wife and two children. The R.M.S Leinster was built in 1897, one of a quartet of identical cross channel steamers. These vessels had been named after the four provinces of Ireland, Ulster, Munster, Leinster and Connaught. They had been built at the Cummel Laird shipyards in Birkenhead in England. The Leinster’s tonnage had been registered at 2646 tons. Because of wartime she had been camouflaged and armed with one 12-pound gun and two signalling guns. As Captain Blackburne and his family boarded the ship they noticed the large amount of passengers and crew many of which were soldiers returning from leave in Ireland. The ship was leaving port with a full complement of 771 persons on board. As the ship sailed out to the Irish channel, the thoughts of U Boat activity were present in the minds of all on board. This stretch of water was notorious for submarine activity. The ship was 16 miles out to sea when a huge explosion shook the vessel. The twenty-seven year old German commander of UB123 Robert Ramm had sighted the ship. He had released three torpedoes. The first had missed the target. The second had struck the port bow. Smoke filled the cabins as flames shot through the air and acrid black smoke bellowed from below decks. Panic and confusion filled the passengers and crew. Captain Birch of the Leinster tried to manoeuvre the ship in order to return to port. It was then that the third torpedo struck the vessel in the area of the engine room. The final deathblow had struck the ship and it was now beyond saving. The devastation of the Leinster had taken place in under ten minutes. As the ship sank beneath the waves, 501 of its 771 passengers and crew were lost. Among the casualties were Captain Blackburne and his two children. His wife survived. Captain Charles Blackburne’s body was returned to the Royal Hospital Kilmainham to be buried along with his son, Peter. On Monday 21st October 1918, the autumn sunshine glistened through the stained glass windows of the hospital chapel. The service was conducted by his grace the Archbishop and very Reverend the Dean of St. Patrick’s. The chapel echoed with the voices of the choirboys of St. Patrick’s cathedral as they accompanied the music of Dr. Marchant. Blackburne’s widow stood dressed in black amidst a sea of khaki uniforms. Their coffins were carried down the avenue and laid to rest side by side in the officer’s cemetery of the Royal Hospital. His daughter though mentioned on the headstone, is not listed at the burial service, her body lost at sea. n September last, Castletown guides sent an email to primary schools in our local area to let them know about our newly structured Maths Trails for 1st & 2nd, 3rd & 4th and 5th & 6th classes in advance of National Maths Week from 13th to 22nd October. These three modules have been designed to help children explore aspects of Castletown that relate to the primary school maths curriculum in a fun and interesting way. Using Castletown House as a tool, budding mathematicians can discover shapes and space, estimations and measures, crack the codes, discover the secrets of proportion and symmetry and develop confidence in looking at cultural heritage in a very different way. Our highest monthly visitor numbers for schools was in June 2018 when 667 schoolchildren had booked with us for both our Living History and general schools visits. In September after schools returned from the summer holidays, our schools visits reduced to 224 schoolchildren. However, we could not have anticipated the huge rise in school visitors in the month of October in response to our Maths Trail mail shot! Our fantastic guiding team at Castletown rose to the challenge and led 2,214 schoolchildren in their class groups through the house using the three Maths Trails which can be downloaded from our website. As the Department of Education has put an emphasis on maths as a priority, teachers are delighted to have the opportunity to explore Castletown using mathematical eyes. As well as looking forward to rolling our Maths Trails out to schools again this coming year, our new Fairy Woods in the Pleasure Grounds/Garden will include a new Biodiversity Trail for all to explore and enjoy. Here is an example of a Maths Trail question from our 5th & 6th class module for you to try: Lady Louisa was having a party on the ﬁrst ﬂoor. She hired a man to clean the windows INSIDE and OUTSIDE on the ﬁrst ﬂoor. It took the man 30 minutes to clean 15 panes of glass. How long did it take him to clean ALL the windows on the ﬁrst ﬂoor if he needed 5 minutes to move his ladder from one window to the next and he took a 20 minute lunch break before he went inside to do the interior glass panes? place in the chamber at Newgrange for Winter Solstice dawn is highly prized. In 2000, the Office of Public Works introduced an annual lottery for those sought-after spots and ever since then the Winter Solstice starts for us on the last Friday in September. That is the day when we have the Draw to select our lucky Lottery winners. Thirty children from our local schools - Slane, Donore and Knockcommon National Schools, come into the centre in a flurry of excitement after being collected from school by one of our BrĂş buses. They pick out 120 names from the large number (28,595 for Solstice 2018) of application forms spread out on the floor. The first 60 names drawn are offered the initial places on the six days we are open for dawn. The other 60 are put on a reserve list. lucky lottery winners not to give up hope. We also have to be mindful that even on promising mornings, it still may not all turn out as we anticipate. anticipation and energy that we feel the bus could fly up the lane to the monument. At Newgrange, we wait outside for a while watching the horizon and then at about 8.35am the group goes inside with a guide who reminds them that they are there to witness an event planned over 5,000 years ago and that cloud or sun, they are fortunate to have been chosen. While the lottery winners are inside waiting, the people on the outside gather. On December 21st, we will have several hundred people and on the others days there will be fewer. The atmosphere outside is totally different from that inside. People are more relaxed and they watch the sun rise with eyes totally fixed on the horizon. sunshine and grinning like their faces might crack, we cheer in celebration. Then we start bringing everyone who has been standing outside into the chamber in small groups. This can take a long time on December 21st. When all the excitement is over our minds turn to food. All year long we look forward to the Solstice breakfasts. It is the only time of year that our Tea Rooms do the Full Irish. On December 21st, we invite friends who have supported us during the year to breakfast and it is a great gathering. We sit down to eat as an extended family and to celebrate our good fortune at being the guardians (for now) of such wonderful monuments. At a presentation ceremony last October, the OPW was presented with the Gold International Large Parks Award for the Phoenix Park. he Phoenix Park in Dublin is one of only two parks in the world to receive a prestigious Gold Award in the Inaugural International Large Urban Parks Awards organised by World Urban Parks based in Canada. The awards recognise the quality of Parks across the globe, the skills of the people who manage them and the value they bring to the cities they serve. The only other winner of a gold award by World Urban Parks is Centennial Park, in Sydney, Australia. "I am both delighted and enormously proud to accept this award on behalf of the people of Ireland and in particular all the staff of the OPW who work to ensure the Phoenix Park in Dublin is maintained to the highest standards allowing it to be enjoyed and shared by the public. We look forward to continuing this tradition so that the Phoenix Park can be enjoyed by generations to come." “This award puts the Phoenix Park on the world stage and showcases Dublin as a green city with the Park providing invaluable health, recreational and environmental benefits for so many communities,” commented Minister ‘Boxer’ Moran, on OPW winning the award. The Phoenix Park was noted for its preservation of a well–protected and managed heritage park, with a broad range of activities and events serving the city of Dublin. The awards are dedicated to supporting the development of parks and open spaces as critical elements in creating vibrant cities and healthy communities. OPW Commissioner John McMahon (2nd from left) and staff of the Phoenix park accepting The International Large Urban Parks award. The OPW is delighted to offer an extended programme of Irish Sign Language (ISL) interpreted tours at OPW heritage sites in 2019. This follows on from similar, very successful programmes in previous years and extends the number of sites where these services are available. This year will see the extension of the programme to include sites outside Dublin such as the Rock of Cashel and Charles Fort in Kinsale for the first time. See poster for details of tours in 2019.
nowth, although less well known than Newgrange is probably even more impressive. Half as big again as its sister monument, not only does Knowth have the two biggest passage tombs ever found, it also has the world’s largest collection of Neolithic art. Visitors don't go inside the passages at Knowth but they can climb on top of the great cairn to get spectacular views. The President and Sabina Higgins attended the opening night of Royal Irish Academy of Music’s performance of the opera Banished at Kilmainham Gaol in January 2019. In partnership with the Office of Public Works and in collaboration with Design for Stage and Screen, IADT Dún Laoghaire, the RIAM was proud to break new ground by presenting the Irish première of Stephen McNeff’s Banished, an adaptation of Steve Gooch’s play Female Transport, to a libretto by Olivia Fuchs in the potent, historical setting of Kilmainham Gaol Museum. Putting young women firmly centre-stage, this brave new work tells the compelling story of women who were transported to Australia in the last years of the 18th and early 19th centuries and their survival against all odds on a long, arduous and dangerous passage to the other side of the world. n the International Day of Peace, 21 September 2018, bells rang out all across Europe in memory of the end of World War I a century ago, and the start and end of the Thirty Yearsâ&#x20AC;&#x2122; War (1618 - 1648). The sound of bells has existed for five millennia, going back well before the founding of Christianity. It is intercultural: whether cathedral bells, Buddhist temple bells, Shinto shrine bells â&#x20AC;&#x201C; all convey a sense of ceremony, the passage of time and transcendence beyond the bounds of language. This is culture in the broadest sense: bringing together daily life, a call for peace, politics, custom, art, collective cultural memory and religion. The sound of bells, wherever it is heard, aptly expresses the focus of the European Year of Culture 2018 and what we want to pass on to next generations: the values of solidarity and peace, and our cultural heritage in Europe. The Rock of Cashel and St. Bernard’s Catholic Church, Watertown, Wisconsin, U.S.A.
y name is Jim Mulligan and I am a seasonal guide at the Rock of Cashel, Co. Tipperary. Off season on 2nd November, 2018 I was visiting the Chicago area of the United States of America and I availed of the opportunity to visit Watertown, Wisconsin, some 120 miles from Chicago. I did so because of the links that exist between the Rock of Cashel and the Catholic Church at St. Bernard’s, Watertown, Wisconsin, U.S.A.
St. Bernard’s was founded in 1843 and the founding parishioners were mostly Irish and Yankee according to the historical timeline of St. Bernard’s Parish which I obtained when I visited the Church and the Parish Centre adjacent to it, meeting with Julie Gates, Parish Secretary. It is said that in 1873 Rev. William Corby C.S.C., who was pastor between 1872 and 1877, was instrumental in getting some of the stone from the site of the Rock of Cashel. The original building was of timber construction and it was decided in 1873 to put a stone structure in place. Fr. Corby had moved with the Holy Cross Fathers to the area having been previously attached to Notre Dame, South Bend, Indiana. He was a Chaplain during the American Civil War of 1861 to 1865 and became famous for his blessings to the troops prior to the infamous Battle at Gettysburg. Fr. Corby was born in the U.S.A. in Detroit but had Irish relations and he made representations to the authorities in Cashel to have some of the limestone transported to Watertown to be used as the cornerstone in the construction of the new Church. These representations were successful as three cwt of the stone or 1600 pounds in US terms arrived whereupon it was sent to McCabe’s Marble Shop in West Side, Watertown before it was laid as a cornerstone on 14th September, 1873. FEATURE ROCK OF CASHEL & ST. BERNARD’S CHURCH followed the disestablishment of the Church in 1869. In 1994 Charles J. Wallman, since deceased, wrote a book titled Built on Irish Faith 150 Years at St. Bernard’s and quite an extensive account is given of this aspect of the re-dedication of St. Bernard’s which took place in 1876. There are also accounts in the National Library and Local Studies at Thurles of the debates in the House of Lords in 1873 surrounding the approval of the request for some stone from the Rock of Cashel. Whether that stone came from the base of the Rock or indeed a portion of the Tower House or Bishops’ residence is the subject of debate, but I would suggest that it came from the ruined residence. Church from limestone sourced at the Rock of Cashel; (right) St. Bernard’s Catholic Church, Watertown, Wisconsin, USA. So an interesting link is confirmed between St. Patrick’s Rock of Cashel in Ireland with St. Bernard’s Catholic Church in Watertown, Wisconsin, U.S.A.
Tintern Abbey & Colclough Walled Garden Joint Ticketing Initiative We are delighted to oﬀer a combined ticket for entry to Tintern Abbey & Colclough Walled Garden from 28 March, 2019! These wonderful sites are both located within the beautiful Tintern estate and for 2019 you can visit both by paying one entry fee. Tickets will be available to putrchase at Tintern Abbey reception. Tickets are fantastic value: Adult €9, Senior €6, Students €5, U-12’s Go Free and Family €21. Dublin Castle holds a wealth of history and there are many stories both old and new that centre around this OPW site. n Easter Monday, 24th April 1916 as the independent Irish Republic was being declared from the steps of the General Post Office in Sackville Street (now O’ Connell St.), Dublin, Ireland, a young British army officer was preparing to go on duty. the Western Front later that year. The Battle of the Somme followed that summer and the 116 British soldiers killed during the insurrection in Dublin city were listed as ‘killed at home’. The British military and government were reluctant to remember soldiers killed in Dublin during the rebellion, as the event had caused some embarrassment. In Britain, Remembrance Day recalls those British and allied servicemen and women who died in two World Wars. The first of these ceremonies took place on the 11th November 1919. As the years went by, the event was commemorated by a two-minute silence, church services and parades to newly erected memorials. In Ireland these events became controversial with the establishment of the Irish Free State in 1922 and in the years that followed, the memories of the war and those who had fallen became a private recollection for those who had served or who had lost loved ones during the conflict. Many of the men and women who fought in Dublin city that Spring over 100 years ago have been consigned to dusty annals, a page in an archive or a paragraph in a book. With the passing of time, we are growing ever more distant from one of the most important events in Irish and British history and those from both sides who took part. The locket that was sold at auction to an unknown Irish bidder had been specifically made to commemorate Guy Vickery Pinfield. Every headstone in a cemetery has a story to tell and Lieutenant Pinfields’ was no exception. This article first appeared in ‘The Irish Times’, May 2013. Images: (facing page) Dublin Castle. ©The Lawrence Photographic Collection. Image Courtesy of the National Library of Ireland. (facing page) Inset: Lieutenant Guy Vickery Pinfield Golden Locket. (above) 2nd Lieut. G.V. Pinfield Gavestone. Dedicated to the memory of John Fitzgerald Kennedy, President of the United States from 1960 to 1963, the Arboretum is a plant collection of international standing. It covers 252 hectares (623 acres) on the southern slopes and summit of Slieve Coillte. It contains 4,500 types of trees and shrubs from all temperate regions of the world, planted in botanical sequence. There are 200 forest plots grouped by continent. Special features include an Ericaceous Garden, (with 500 different rhododendrons, and many varieties of azaleas and heathers), dwarf conifers, hedges, ground covers and climbing plants. To mark this special milestone in the arboretum’s history the OPW joined forces with the ever popular Kennedy Summer School to celebrate with a family programme of talks, tours and entertainment in September and admission to the arboretum was free up to Sunday 9th of September. In order to add to the visitor experience on Sunday Minister Kevin “Boxer” Moran launched an engaging new exhibition on the main attributes of the Arboretum, its special plant collection and its important historic landscape. President Higgins attended the closing event of the 2018 Kennedy Summer and addressed the Gala Dinner. The President also planted a tree in the Arboretum to commemorate the 50th Anniversary of the Memorial Park. Minister of State Mr Kevin Moran, T.D., Matthew Jebb, Director of the National Botanic Gardens and CEO of the John F. Kennedy Trust, Sean Connick. Pictures ©Patrick Browne. In 2018, JFK Arboretum and Memorial Park at New Ross celebrated 50 years since it opened to the public. Above left: Cllr Martin Murphy, Matthew Jebb, Director of the National Botanic Gardens, CEO of the John F. Kennedy Trust Sean Connick, Minister of State Mr Kevin Moran, T.D. and Cllr Anthony Connick. Above right: Minister of State Mr Kevin Moran, T.D., Matthew Jebb, Director of the National Botanic Gardens and Rosemary Collier Principle Officer OPW. Centre: L-R: Mr Kevin Moran, T.D., Matthew Jebb and Sean Connick. Below: Pictured at the official opening of the new interpretative exhibition at the John F. Kennedy Arboretum, New Ross, Co. Wexford. L-R: Bernie Sinnott, Gerry O’Niell, Leona Tuck, Matthew Jebb, Director of the National Botanic Gardens, Minister of State Mr Kevin Moran, T.D., Rosemary Collier Principle Officer OPW, Louise O’Brien and Delia Hickey. Pictures © Patrick Browne. hen one thinks of the stately Palladian mansion, Castletown House, the words Bram Stoker and Dracula, rarely, if ever, spring to mind! Yet thanks to Monaghan scholar Fearghal Duffy a connection between this stately neo Palladian mansion and Bram Stoker has finally come to light and like all great discoverys this one occurred quite accidentially! It happened over a cup of tea in Monaghan with one of Duffy’s friends who also happened to be a guide at Castletown House, Catherine Bergin. Bram Stoker by W. & D Downey photograture, © National Portrait Gallery, London. the name of Stoker’s main heroine, Mina Murray (married name Harker). And what has this has all this to do with Castletown House and Parklands? Among the collection of art in Castletown are the images of Mary Ann Westenra and Harriet Murray, in the Blue Bedroom and Dining Room respectively. This interesting connection has shed new light and renewed interest in these wonderful portraits! In order to see these treasures come to Castletown, entering freely and of your own will…. 1.
he church and round tower at Drumlane in Co. Cavan, have been in the care of the Office of Public Works for the past 138 years. slowly towards the lake. The presence of a series of large buttresses against the outside of the long side walls indicated a long history of structural instability. In an early image of the church, dating from 1792 in ‘The Antiquities of Ireland, Volume 2’ by Francis Grose, the church has a large steeply pitched roof which must have exerted a tremendous outward thrust on the long side walls. The buttresses were already in position in 1792 to provide additional stability and prevent the roof from causing the side walls to collapse. The outward pressure on the side walls was reduced when the roof perished but the gable wall was then fully exposed to the weather and began to deteriorate. We installed crack monitors and over the following years regularly inspected the gable wall for signs of active movement. In March 2014 Kieran Walsh of the OPW Structural Engineering Section, and I carried out a more detailed inspection from a hoist in order to assess the condition of the large vertical cracks at the junction of the east gable and the two long side walls of the medieval church. The inspection confirmed that the gable wall had moved and was in need of stabilisation works. The project was included in our 2014 business plan and works began in June of the same year. The first part of the project was the protection of the grave slabs near the east gable, enclosing them in timber covers. We then erected a scaffold around the gable wall to facilitate the works. We were able to examine the masonry work at close quarters and do some preliminary opening up work. Mary Bourke-Dowling was an Irish suffragette and republican who spent time in prison for both causes in the early years of the twentieth century. days imprisonment in Holloway Jail, alongside several other Irishwomen. At their trials the suffragettes claimed that such destruction was the only form of protest available to them. Upon her release from prison in December 1911, Mary Bourke-Dowling returned to Dublin. At a special meeting of The Irish Women’s Franchise League to welcome back the released prisoners, she was presented with a medal engraved with the League’s statement of intent: ‘From Prison to Citizenship’. This medal, from which the exhibition takes its name, is displayed to the public for the first time. In 1918, the Representation of the People Act was passed. This gave women over 30, who also had property rights or a university education, the right to vote. Women all over Ireland cast their vote for the first time in the December 1918 General Election. EVENTS SUFFRAGETTE EXHIBITION Exhibition runs at Kilmainham Gaol Museum until Sunday, April 7th, 2019. Sufferagette (sic), Bow Street Police Station, London’ is of particular interest. Other items include sketches and watercolours painted by Bourke-Dowling whilst imprisoned during the Civil War. Many of these objects are on display to the public for the first time. Unfortunately, little is known about Mary Bourke-Dowling’s political life after she left Kilmainham Gaol in 1923. She spent years fighting to be reinstated to her position in the Civil Service and was finally successful in 1932. She married William H. Lewers in 1933 and as a result may have had to leave her job once more. A ‘marriage bar’ was introduced in the 1930s which made it compulsory for female civil servants to stop working once married. This was not repealed until 1973. Mary Bourke-Dowling died at her home in Clontarf in July 1944. Text by Ronan Mac Giollapharaic through many generations of farming. Similar to the Burren, the ancient practice of moving cattle to the higher exposed ground in winter also takes place. Even though the Aran Islands are in County Galway they are a geological extension of the Burren and sit directly west of County Clare. Dún Aonghasa is within a SAC (Special Area of Conservation), and the cliff face is an SPA (Special Protection Area) due to the presence of breeding birds. The exposed limestone, scoured by glaciers during the last ice age dominates the area. differs from the mainland version as it has a different colour on the hairs on the side of its thorax. It is often found feeding on Birds-foot Trefoil and Devil’s-bit Scabious. Also found are the Cuckoo bumblebees (Bumbóg Cuach), which like the Cuckoo bird invade the nest of a different species, but dispatches the Queen and uses her workers to raise her own young. on-site at Dún Aonghasa we regularly identify close to 100 species during a season. From orchids such as the Bee Orchid (Magairlín na Mbeach), Frog Orchid (Magairlín an Loscáin), Pyramidal Orchid (Magairlín na Stuaice) to Saxifrages (Mórán), Yellow Rattle (Gliográn), Birds-foot Trefoil (Crobh Éin) and many more. Birds Being a cliff site there are a large variety of birds to be seen. The sea birds are large and graceful, the terrestrial birds are smaller and flighty. In Spring the Wheatear (Clochrán), a common migrant, arrives and nests in the stones of the fort. The Skylark (Fuiseóg) drops from above, singing its changing tune. Peregrines (Fabhcún gorm) and Sparrow hawks (Spioróg) cruise the site hunting for lunch and on windy days Fulmars (Fulmaire) swoop the cliff trying to land only to pull away before attempting another approach. The entire cliff face of Inis Mór is an SPA for breeding seabirds. Colonies of Guillemots (Foracha), Razorbills (Crosán) and kittiwakes (Saidhbhéar) can be seen as dive-bombing gannet’s (Gainéad) hunt for fish. My favourite time is when the Choughs (Cág Cosdearg) arrive. With their scarlet beaks they probe the ground for grubs, all the while squabbling with each other constantly. In flight they play with the wind currents along the cliff edge, allowing themselves to fall and then in a flash recovering. The Sea The sea, ever-changing from large rolling Atlantic waves, to days where it looks like glass, is another habitat full of life. Dolphins (Deilfeanna) and Seals (Rónta) make an appearance from time to time and on rare occasions Whales (Míolta móra) are sighted. Early in the season over the last couple of years we've been treated to Basking Sharks (Liamhán gréine) cruising along the cliff below Dún Aonghasa, feeding on tiny plankton. The days the basking sharks appear there is as an excitement in the air. Guides and visitors alike forget about archaeology for a time and rush to the cliff edge to catch a glimpse before these leviathans disappear. Pictures: Lighting Ceremony at the Phoenix Monument, Chesterfield Road, Phoenix Park, Dublin on 17th September 2018, officiated by President Michael D. Higgins and his wife Sabina Higgins. Inset image: Greening of the Phoenix Park Column for St. Patrick’s Day 2019. Kevin ‘Boxer’ Moran T.D., Minister of State for the Oﬃce of Public Works (OPW) and Flood Relief, launching the Roscrea Loyalty Scheme last summer, a initiative to encourage people to shop locally and to visit Roscrea Castle, Damer House and the Blackmill for free. The OPW worked with the Roscrea Chamber of Commerce and Tipperary County Council to bring this initiative to fruition. Under the initiative, shoppers spending €15 in local participating retail outlets will be provided with a voucher which will entitle them to a free family entry at Roscrea Castle, Damer House and the Blackmill. A similar initiative has been in operation in Cashel since March 2015 and has proven to be a great success in promoting tourism and economic activity in the town. Speaking at the launch of the initiative in Damer House, Minister Moran said, "I am delighted that my Office, the OPW, in conjunction with all the local partners have initiated this scheme today for Roscrea. Its success has been proven in Cashel and I hope that a similar positive impact is experienced in Roscrea. The importance of tourism to the Irish economy cannot be underestimated and while the remit of the OPW is conservation and presentation, I am delighted that my Office can get involved in schemes such as this”. ROSCREA CASTLE The stone castle consists of a gate tower, curtain walls and two corner towers dating from the 1280â&#x20AC;&#x2122;s. The castle rooms are furnished and host temporary exhibitions. Its chimneys and gables are early 17th Century features, but the lower levels of the castle are the original stonework. The two towers housed three storeys, one of which has an octagonal interior called the "Duke of Ormond's Tower". DAMER HOUSE Built in the early 18th century in the Queen Anne style, Damer House is an example of pre-Palladian architecture. This elegant three-storey Georgian house with nine bay windows was built by Joseph Damer in the early 18th century in the courtyard of Roscrea Castle. One of the rooms is furnished in period style. BLACK MILL A restored mill displaying the original St. Cronan's high cross and pillar stone. presentation”. Over a hundred birds, painted on separate panels, plunge, swoop and fly in this large installation. In this and other works in the show Dunne uses colour and gesture to evoke the vulnerability and energy of his subject, and asks the viewer to think on issues of emigration, migration, absence, and our changing climate. exhibited widely, his recent shows include 'Crossing the Salt', Limerick City Gallery (2018), 'In the Presence ofBirds' (2017), 'The Flower’s Pilgrim' at the Molesworth Gallery in Dublin (2015), and 'Magenta Honey' at The Lab in Dublin (2015). The exhibition is open to the public and is free of charge. elebrating the 50th anniversary of Sir Alfred Chester Beattyâ&#x20AC;&#x2122;s magnificent bequest, Gift of a Lifetime presents a choice selection of masterpieces from this unique collection. An internationally successful mining magnate and generous philanthropist, Beatty was one of the most prolific and discerning collectors of his generation. From his early years in New York, through his career in London and travels overseas, Beatty acquired rare books, manuscripts and decorative arts of the highest quality and rarity from Europe, the Middle East and Asia. greatest beauty crafted for powerful rulers to treasures tracing the history of world religions, the artworks drawn together in this exhibition and accompanying catalogue capture the breadth and wonder of this exceptional legacy: a gift to the nation, for Ireland to share with the world. Admission is free. The Office of Public Works presents a stunning exhibition of sculptural pendants and rings by master-goldsmith Rudolf Heltzel, at the State Apartments, Dublin Castle – on tour from the National Design & Craft Gallery and Design & Crafts Council of Ireland. An icon of Irish craft and design, Rudolf Heltzel has gained an international reputation for the originality, quality and timeless aesthetic of his craftsmanship with each piece created meticulously by hand using some of the world’s oldest jewellery techniques. This exhibition will showcase many of his most ambitious and technically complex designs, presenting pieces selected from his personal archive alongside new work in three of his sculptural pendant collections – Rock Crystal, Tourmaline Butterfly and Druzy. A series of spectacular gem rings designed by Heltzel will also be presented in the exhibition. Date: 16th March 2019 Times: 10.15am & 11.30am. 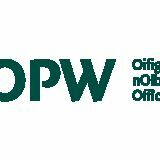 The Office of Public Works Heritage Card provides for free admission to all fee-paying state-managed OPW Heritage Sites located throughout the country. 2019 is a great year to visit a heritage site as many sites have new and additional developments, events and exhibitions. For information on location and opening times of sites that can be visited with an OPW Heritage Card, please visit www.heritageireland.ie/en/info/heritagecards. This is your opportunity to explore Ireland’s iconic sites such as Kilmainham Gaol, Newgrange, Dublin Castle, the Rock of Cashel and Clonmacnoise. Not only visit these jewels in the crown of Irish tourism, but to also discover the hidden gems – Portumna Castle, Emo Court, Swiss Cottage, Glebe House & Gallery, Mellifont Abbey, Knowth, Parke's Castle – to name but a few. Lose yourself at these gorgeous, lesser known sites and find a new favourite every visit. How many can you explore this Spring/Summer? No liability shall attach itself to the Office of Public Works or the State for any damage, injury or loss to the person or prope rty of visitors to these sites howsoever caused. Leis an gcárta seo, beidh cead isteach gan teorai sealbhóir chuig gach nn ag an Láithreán Oidhreachta atá sa bhróisiúr Láithreáin Oidhreachta na hÉireann ar feadh aon bhliana amháin (seachas Feirm eacha Traidisiúnta Mhuc rois). Tá an cárta seo neam h-inaistrithe agus ní fhéadfaidh ach an sínitheoir leas a bhaint as. Ní bheidh aon dlitean as ar Oifig na nOibr eacha Poiblí ná ar an Stát as díobháil, gortú nó caillteanas ar bith a tharlaíonn don duine nó do shealú chas daoine a thuga nn cuairt ar na láithreáin seo, beag beann ar an gcaoi ar tharla sé. Heritage Cards are vaild for 1 Year from date of first use.